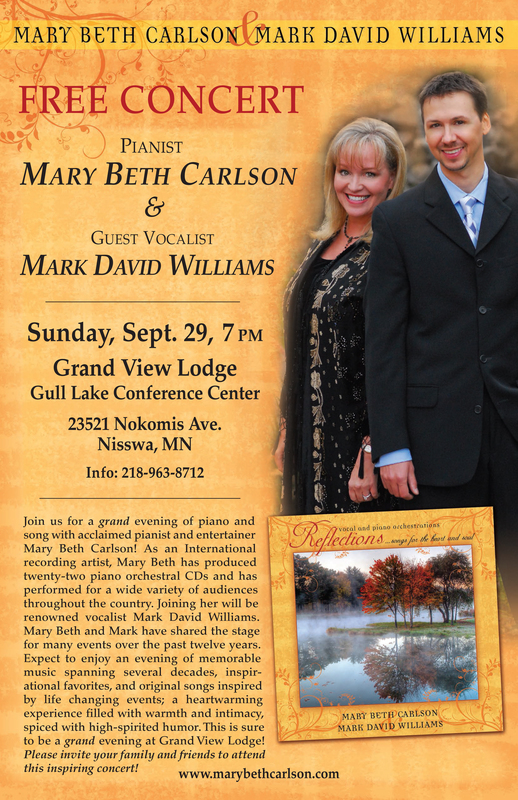 Mary Beth Carlson, acclaimed recording pianist and entertainer, will perform in concert Sunday, September 29th, 7:00 p.m., at the Gull Lake Conference Center at Grand View Lodge in Nisswa, Minnesota. The concert will feature specially chosen songs from the twenty-three piano orchestral CDs she has produced and recorded, several of which have been distributed internationally. Expect to enjoy an evening of memorable music spanning several decades, inspirational favorites, and original songs inspired by life changing events; a heartwarming experience filled with warmth and intimacy, spiced with high-spirited humor. Mary Beth has performed for a wide variety of audiences, and her inspiring arrangements have been heard throughout the country on many radio stations, including KTIG 102.7 FM in Pequot Lakes, Minnesota. Joining Mary Beth will be renowned vocalist Mark David Williams. Mark has recorded four vocal CDs and has had leading roles in several musical productions. In 2002 he won the KARE 11 Minnesota Idol contest. Mary Beth and Mark have been performing together for numerous events over the past thirteen years and have combined their musical talents on two CDs, Reflections … songs for the heart and soul and The Miracle of Christmas, both featuring a blend of impassioned piano orchestral selections and stunning vocal performances. For additional information about the concert please contact Grand View Lodge at 218-963.8712. For more information on Mary Beth and Mark, please visit www.marybethcarlson.com and www.markdavidwilliams.com. As hard as it is to admit, it’s that time of year again. The summer air, full of heat and humidity, will soon be giving way to the crisp, cool air of autumn. You can feel it, smell it and you can definitely see it. Radiant yellow birch and aspen, golden oak and scarlet maple paint a portrait of such brilliance, it can’t be missed. Peak, fall color in the Brainerd Lakes Area are usually experienced during late September to early October, however, fall colors and their peak color displays change each year according to location, precipitation and temperature variances. The breathtaking yellows, oranges, reds and browns that we witness during the fall are caused by four main groups of biochemical; chlorophyll, carotenoids, anthocyanins and tannins. Varying amounts of these chemicals will give subtle variations in color from one leaf to the next or even tree-to-tree. If you enjoy outdoor activities, Grand View Lodge offers you a wide variety of options to choose from. Located near the Paul Bunyan Trail, you can get on your bike or one of our complimentary bikes and pedal beneath the canopies of Minnesota’s vibrant fall branches. Horseback riding and guided nature hikes are also available throughout the week. If fall golf is what you are seeking, take a swing at one of our three golf courses ­– The Garden, The Pines or The Preserve – all located in Minnesota’s rich landscape of forest, which glows brightly with the fall leaves. Cool weather, prime course conditions and the love for the game allow players to enjoy all that fall has to offer. If you prefer to unwind by the water, join us on our Autumn Pontoon Cruise every Friday through Monday. Sit back and watch Gull Lake sparkle amid woods full of maple, oak, birch and aspen. Or get up-close and personal on our weekly kayak tour, or better yet, go on your own color tour by kayak, canoe or boat. Buckle up and enjoy the scenic landscape by cruising along Hwy 371 and Hwy 6 – make sure not to miss the country roads between them! Highways 77, 78, 107 and 13 offer breathtaking views and brilliant fall colors that dance in the crisp autumn air. Click here for the best roads for a color tour. Join us this fall to celebrate and fully revel in the brilliantly colored woods of the Lakes Area. We will be offering our Fall into Wellness Package all month long with rates starting at just $135 a night, special discounts on spa and golf, and a wide variety of wellness activities. Click here to see the Department of Natural Resources Fall Color Report so you make sure you visit the north country when the leaves are most vibrant!